The emergence of PRISM has caused a stir in the United States. It is a collaboration between the National Security Agency (NSA), the Federal Bureau of Investigations (FBI) and the biggest tech companies in the country. The agreement has provided the U.S. Government access to data including audio communication, videos, photos, emails, documents, call logs and text messages since 2007. 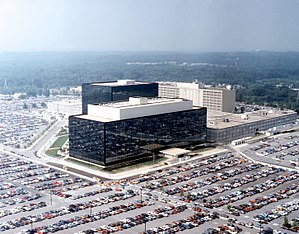 Headquarters of the NSA at Fort Meade, Maryland. How has PRISM come to light? On Wednesday June 5th, a classified order was shared and made public. The order to Verizon Wireless by the Foreign Surveillance Court directed the company to turn over domestic & foreign call data from the past and in the future. Such data would be gathered by the millions and would provide sender and receiver of calls, duration, time and location. James Clapper, the Director of National Intelligence made statements suggesting that the collaboration existed and that the government was operating within the legal system. Here’s what Clapper wrote about PRISM. , 29 year old, Edward Snowden was a member of defense contractor Booz Allen Hamilton. Snowden claims that a “massive surveillance machine” is in the making and that he leaked the information to “inform the public as to that which is done in their name and that which is done against them.” Snowden is currently in Hong Kong, China while various US diplomats are calling for the country to extradite him. As if internet security and privacy were not already a hot topic, it can be an effective transition into offering Data Breach Response Coverage. The Breach Response product is tailored to healthcare, retail, hospitality and higher education operations. The product is geared to moderate the results of a breach of data. These mitigation tools will help minimize brand damage and legal liability by offering the following coverage. For claim examples for Data Breach Response, click here.